This ice cream product list is not intended to be comprehensive. 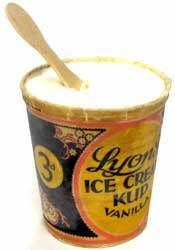 However, it does cover the majority of the ice-cream lines manufactured by Lyons Maid and its subsidiaries between 1930 and 1987. Many of Lyons Maid's products, especially the more popular lines, were repackaged from time to time to meet the changing catering needs and growing home freezer ownership. These variations of packaging and sizing have been largely ignored in this list. Most of this information has been gathered from the in house journal Lyons Mail. Since large sections of this journal are absent there are a number of date gaps in the records here. It can be seen that a large number of products were targeted at children. These so-called hand-held confections started to appear after the Second World War and progressively became more sophisticated. By the 1970s this market represented about half of the total ice cream sales. Take-home desserts also became more popular as the tendency to make puddings fell off. 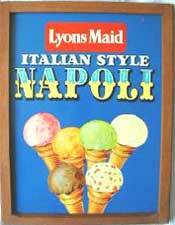 The Lyons ice cream subsidiaries of Bertorelli, Tonibell and Midland Counties Ice Cream manufactured and marketed their own products. Some of these are listed at the end of the main table. Bertorelli specialised in high quality catering ice creams to hotels etc. 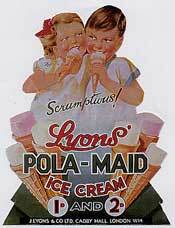 Tonibell sold from travelling vans and Midland Counties Ice Cream made similar products to Lyons. In fact all the ice cream companies copied each other so as not to loose market share. An early description of ice-cream manufacture at J. Lyons & Co can be found in The First Food Empire, A History of J. Lyons & Co. Vanilla ice cream. priced at 2d. Circular ice cream with paper wrapping priced at 2d. Vanilla and coffee flavoured ice cream coated in chocolate. Priced at 2d. Hand made and consisting of layers of pistachio, strawberry and vanilla ice creams inter-layered with slices of sponge cake. Decorated with creamy scrolls and glacé cherries and encircled with a gold band. 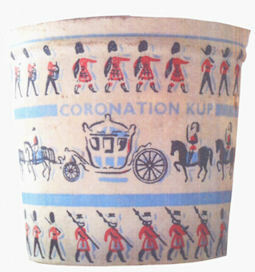 Originally made for catering trade they were made available to public in 1952. Ice lollies. Contained milk solids. Ice cream on a stick with frozen strawberry-juice shell. Soft ice cream was introduced following the successful development of special equipment. This was sold to shops and caterers who could dispense it into cones direct from the machines. 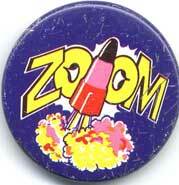 Zoom was introduced in April/May 1963 as part of the Steve Zodiac Fireball XL5 TV programmes. Ice lolly based around the TV series Stingray. Priced at 4d. the lollies were available in four flavours vanilla, strawberry, lemon and orange. The Super Sea Jet (which cost 2d. more) had three flavours in one, mint and vanilla dipped in chocolate. Ice lolly launched priced 8d. It had a combination of coffee and advocaat flavours and was coated in milk chocolate with biscuit pieces. Supported by TV advertising. Pomadour Dolls, Teddy Bears and various fruits Exhibited at Hotelympia for catering trade. Ice lolly on stick. Launched nationally. Designed primarily for the 3 million girls in Britain aged 5-15. Based around Gerry Anderson's Thunderbirds TV series. Lady Penelope's Rolls Royce number plate was FAB 1. Priced at 6d it consisted of strawberry fruit ice and vanilla ice cream with top dipped in chocolate and coated with 'hundreds and thousands' sugar confectionery. 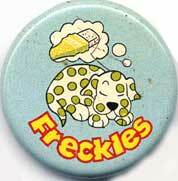 Seven new lines of caterers ice cream was launched in the Autumn of 1967. Peach Slice. Layers of peach and raspberry ice cream with peach sorbet centre made up in a cassata-shape. Egg Caramel. Triangles of egg and vanilla ice cream surrounded with a caramel ice cream. Tutti Frutti Whirl. Flavoured Tutti Frutti and strawberry ice cream presented in a new 'kup' design. Orange Gateau. Layers of orange and vanilla ice cream decorated with candied orange slices and chocolate whirls. Strawberry Peach Gateau. Chopped peaches blended in strawberry ice cream. New bulk ice cream in Butterscotch and Strawberry Ripple flavours. Italian-style bulk ice cream served from cabinets in cones. Test market in selected areas. 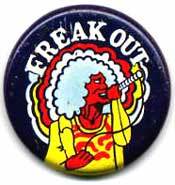 Went national in March 1970. 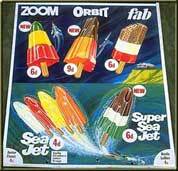 Rocket shaped lolly based on Captain Scarlet and the Mysterons. Priced at 9d. it resembled Zoom and was flavoured chocolate and orange. A new range of King Cornets were introduced with Frankie Howerd doing the TV commercials. Priced at 1/-. It is not known when the King Cornet was first introduced. Six entirely new kind of novelty ice creams were test marketed, in different parts of the UK, during the 1968 season. The Gondola range of three Italian-style ice creams were in different packaging. One in a cone, the other two in hand-held kups. Designed for the adult market, with a recommended selling price of 1/6, they came in three varieties: Mocca, a coffee ice cream with chocolate chips and chocolate sauce; Cassata, a strawberry ice cream with a core of tuttie frutti; and Cherry, a cherry flavoured ice cream with a glacé cherry and cherry sauce. Originally some of the test marketing included a strawberry fruit ice topped with strawberry biscuit crump. Some kups were: vanilla and mandarin &endash; Italian-style vanilla ice cream and a mandarin fruit ice containing mandarin pieces. Vanilla and raspberry &endash; an Italian-style vanilla ice cream with a raspberry fruit ice sprinkled with raspberry pieces. The test markets were Sussex, Hampshire and the Isle of Wight. A novelty ice cream created for children to test new markets. There were two types in the range. Playboat holding a cargo of vanilla ice cream and an orange ice cream, and Playcar, fuelled with a vanilla ice cream and a raspberry ice cream. 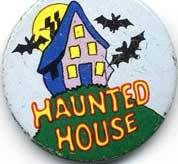 When the ice cream had been eaten &endash; a plastic spoon was provided for each product &endash; the container could be used as a toy. The recommended retail price was 9d. The test market area was Bristol and several major seaside resorts in the West Country. This was designed for teenagers and like the previous Gondola and Playpacks, was created to test the market. It consisted of raspberry and vanilla ice cream rippled with a blackcurrant sauce and packed in a container with a push-up stick. Scene was made to test teenagers response to new ideas in ice cream. The recommended retail price was 1/3. The test market s were south and south-east Kent. In May 1968 a new range of take home ice creams were launched on the British market. Designed as a after dinner dessert the bricks were priced at 3/-. I was hoped that consumers might also buy the ice cream in the winter. The flavours were: Mint Choc Chip, peppermint ice cream with real chocolate chip. Double Choc Ripple, consisted of a dark chocolate sauce swirled into a smooth chocolate ice cream. Maple Walnut was a maple walnut flavoured ice cream sprinkled with chopped walnuts and rippled with a maple syrup sauce. It is thought that Raspberry Surprise was added. Test market of 'evening ice cream'. Made from frozen yoghurt three different lines were made. Battenburg consisted of vanilla and strawberry chequered frozen yoghurt surrounded by coffee ice cream It sold for 3/6d for a five-portion pack. Strawberry Ripple Roll was frozen vanilla yoghurt rippled with a sauce made from crushed strawberries and wrapped in a soft chocolate sponge. Providing four portions it sold for 3/-. Partners was a twin pack of strawberry and vanilla yoghurt topped with chocolate sugar whirls. Initial marketing took place in London and the home counties. Based on Playpacks, first test marketed in 1968, the individual moulds, designed for children, were shape like a Racing-Car, a Doll's House and a Boat which could be used as toys when the contents had been eaten. all packs were available in tree flavours; strawberry, lemon and chocolate and were priced at 9d. 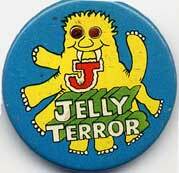 A family size was also available in a Jelly Mould shape for 2.6d. The mousse had to be thawed one hour before it could be eaten. A luxury ice cream designed for the cinema trade at the very 'high' price of 3/-. it was designed specifically for road-shows &endash; the book-in-advance films such as Doctor Zhivago. It was the first ice cream to be sold in cinemas with a liqueur added. Cherry brandy was chosen because of its positive flavour. to this were added cherries and a cherry brandy ice cream parfait. Encore was packaged in a wedgwood-blue plastic container with a wrapped plastic spoon clipped to the lid. The packaging won an award in the Institute of Packaging's 1970 Starpacks contest. A new range of children's ice lollies costing 4d. It came in four flavours: orange, strawberry, banana/chocolate and strawberry/vanilla. Advertising was linked to the Thunderbirds TV programme. The launch was linked to a promotional camera offer. This was a re-formulated version of Sea Jet with a price increase to 6d. There were two versions: raspberry/orange and strawberry/vanilla with a choc-dipped nose cone. A lolly similar to Fab aimed at girls 10-15 years. Three quarters covered in chocolate and hundreds and thousands and costing 9d. Backed by TV advertising and opportunity to collect a set of picture pop stars. additionally there was a range of other promotional material such as wall charts and T-shirts. Thought to be a cinema line. No details available. Priced at 2/6 Strawberry 'n' Pear bricks consisted of strawberry ice cream ripled with strawberry puree, with a centre of pear water ice. It was the only pear-flavoured ice cream on the market and was designed for the take-home trade. Flavours include Neapolitan, Raspberry Ripple and Vanilla. Made at Liverpool factory. Price 7d. made at Liverpool. A new range of take-home bricks were launched in March with the packaging carrying ice cream recipes. 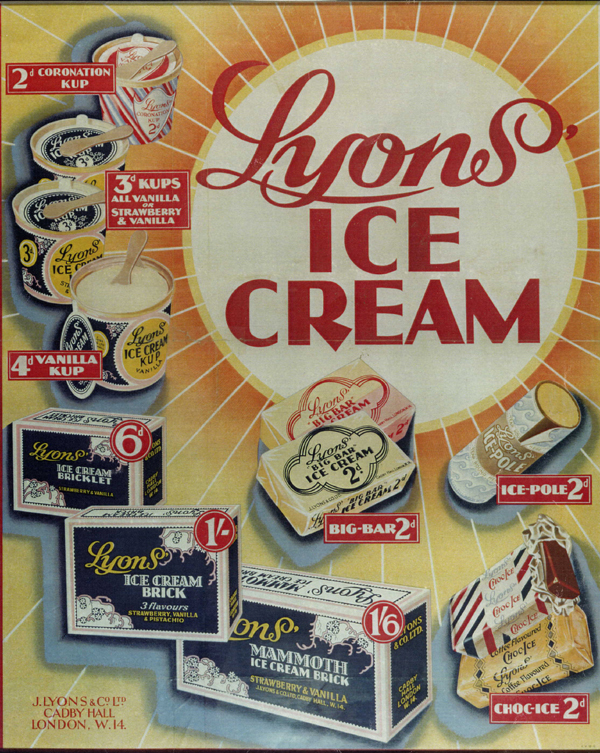 Devised by Susan Owen, Lyons Maid's home economist, a different recipe is printed on each of the six cartons to match the flavour of the ice cream in the carton. For example for a vanilla Handy Pack, Susan's recipe was called Sunshine Sundae and to the ice cream would be added marmalade and chopped walnuts. This was an addition to the Goblet Range of cinema ice creams with a price of 2/-. It had vertical sections of Cornish dairy ice cream and orange water ice with crushed pineapple pieces. An ice cream designed for cinema audiences which was on sundae on a stick. It consisted of Cornish dairy ice cream, rippled with raspberry sauce and covered in a jacket of peach water ice. Packed in a carton it looked attractive on the cinema sales tray. It was priced at 1/6. Three-flavour ice lolly with cola water ice, pineapple kreem ice and strawberry water ice. All at 7d. Accompanied by free racing car promotion. This was an addition to the King Range, in-hand products, for adults. with a recommended price of 1/6d the newcomer is a blend of pineapple sorbet and vanilla ice cream rippled with pineapple sauce and its launch coincided with a new plastic-style packaging for the whole range. A 10d. iced lolly for children. Orange Maid, the orange drink on a stick, was re-launched as Super Orange Maid and came to the customer in a new red, orange and gold wrap. The recommended price was 1/-. Three new-style mousse lines were launched in August. All were dual flavoured, presented in single portion fluted jelly mould containers. The varieties were: raspberry and vanilla topped with raspberry sauce; orange and vanilla topped with orange sauce; and apricot and vanilla with chopped fruit cocktail. Twenty new products were re-launched in 1971 towards the younger generation. These and all existing packs were radically redesigned. Prices too were adjusted to decimal currency and in general all prices were increased.Three original ice lollies for children were launched. Two at the popular price of 2p. the other at 5p. Priced at 2p. exceeded sales target by 114 per cent. Lemon, lime and grapefruit. Priced at 5p. Exceeded sales plan by 35 per cent. Double-sized ice cream pack introduced nearly three years ago to help dealers sell more ice cream at one time and the housewife to have a reserve of ice cream in the fridge. Cornish Choc Ices went on test market sale on 23 August. Priced at 24p. Restyled with added vitamin 'C' to give ice cream a special appeal to winter sweet. Price 15p. A lolly for children with a recommended price of 3p. Purple in colour. A new formula and new name keeping its rocket shape. Price not available. Blackcurrant flavour and colour. Price 3p. Yellow, banana-flavoured shell enclosing a pink spearmint core. Price 3p. A vanilla ice cream in a chocolate coating on a stick for children. Price 5p. For teenage girls, a strawberry and vanilla kreem ice, half of it choc coated. Price not known. For both teenage sexes a coffee-flavoured ice cream in a choc 'n' biscuit coating. Price not known. Vanilla ice cream coated in dark chocolate at 5p. Slices of vanilla and caramel ice cream with a light chocolate coating at 6p. Cornish dairy ice cream with a super-fine dark chocolate coating at 7p. A hand-held water ice for adults. Flavoured with Herefordshire cider at 6p. A take-home version of the Napoli Italian-style ice cream until now only available as an in hand line. Price not available. A luxury vanilla ice cream that can be taken to the table and served from the container. Containing a half litre the container had a gold design around the sides and a gold top. It was the first plastic container of its type on the ice market. A half gallon see-through plastic container for home freezers. Price not available. Two new take-home bricks launched in May. Pineapple Surprise and Coffee Surprise. The former is vanilla ice cream rippled with through with pineapple sauce, sandwiching a pineapple sherbet centre. Coffee Surprise is a vanilla ice cream with coffee sauce, and a centre of coffee ice cream. Price 18p. Catering lines of single-portion cups comprising four flavours. Vanilla, Strawberry & Vanilla, Chocolate & Vanilla and coffee with coffee rippled vanilla. Each cup had a showboat paddle steamer on its side and top. A catering range of pre-sliced portions of ice cream wrapped on four side and 'unzipped' for service. Four flavours included Neapolitan, Strawberry Stripes (a combination of strawberry ice cream and strawberry rippled ice cream), Tutti Frutti and Vanilla. 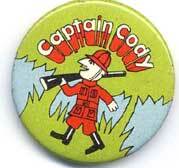 Invented by Harold Boon, Production Manager. A revamped range of take-home ice cream. Family Sweets covering small, medium and large packs consisted of six varieties &endash; a new chocolate flavour ice cream brick, and four well-established favourites &endash; vanilla, Strawberry ripple, raspberry ripple and three flavoured Neapolitan Gaiety. Available in sizes from 11 fl ozs to one litre. This range included six more ranges. Peach Swirl, Raspberry Swirl and Strawberry Swirl which met a demand for ice cream and sorbet. Double Choc Ripple with a new sauce, Hazelnut Surprise with more nuts and Pineapple Surprise. A combination of cream soda water ice with raspberry kreem centre. Price 3p. A strawberry jelly centre with a vanilla kreem ice shell and a choc dipped top covered in sugar strands. Price 4p. A vanilla ice cream bar with choc chips. Price 4p. A strawberry and lemon ice cream marbled together to form a psychedelic pattern on a stick. Price 5p. Blackcurrant water ice priced at 2p. Cola water ice and priced at 2p. A vanilla bar for adults with orange choc chips at the recommended retail price of 6p. A vanilla bar with mint choc chips for adults at 6p. A pineapple fruit ice surrounding a centre of vanilla ice cream. It joined the Raspberry Mivvi both with a price of 6p. A special process was used to produce this range by printing pictures on the ice cream. There were eight different pictures. Frankenstein's Monster, a spook, a skeleton, spider and web, some bats, a wicket witch and a creature bearing a vague resemblance to Jelly Terror's mother-in-law. The pictures appeared on the ice cream in pink, orange, red, green and blue edible colouring. Children did know what picture they would get until the wrapper had been removed. Price 4p.